Winner of a bronze award at the 2018 International Cheese Awards. Godminster’s organic vintage cheddar truckle. Handmade by Godminster with milk from their own dairy herd, using traditional techniques. The result is creamy, rich and buttery – extraordinarily good. This fine cheese comes in a handsome burgundy wax casing for maximum impact. Buy cheese online and we’ll deliver straight to your door. Keep in the fridge for up to 7 days. Serve at room temperature. Soon after converting to organic in 1999, Godminster realised that their milk alone would never generate enough to sustain the farm. They decided to make their own cheddar, so set to work with a traditional 70 year old recipe. 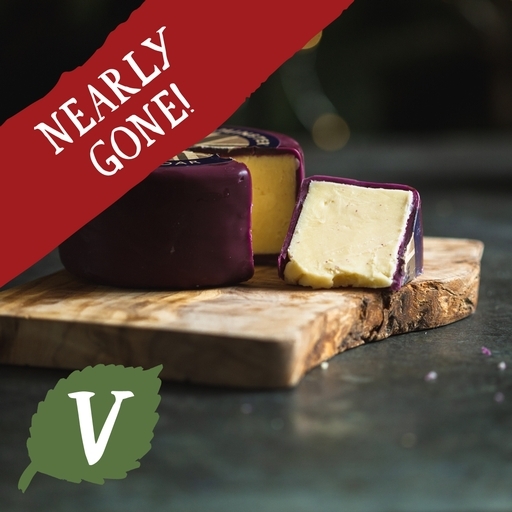 The resulting vintage cheddar went down a storm at local farmers’ markets in Somerset. It now has a growing fanbase, including us at Riverford! We hope you love it too. Pasteurised cows milk, salt*, cultures, vegetarian rennet.